This is also a heavy duty which means it can take a beating and be exposed to the weather. If you are using the monitor for normal bumpy driving you can use our regular monitor but this one is for those who need something that will stand up to a lot and its made for the toughest and roughest conditions. The camera and monitor are THE MOST durable we have, with incredible adjustability and night vision clarity. The Heavy Industry Housed Backup has a metal housing that will protect it from just about anything. 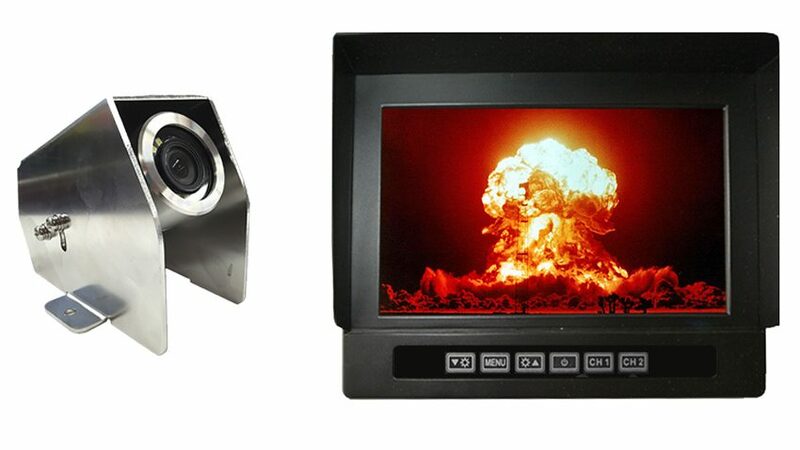 This is by far our toughest built backup camera you will ever find, it can be pounded hard and still operate without issue. The camera is wartime ready, its home is on a SWAT vehicle or an MPV. Like our other cameras, It can also be used in cars, vans, buses and even industrial sized caterpillar trucks, operated in the harsh oil sand of Canada. This backup camera can take a direct hit from a rock and it will still work like new. The camera has an IP rating of 69K and has a built in microphone as well for audio. In the case of an explosion this camera will not break apart or melt, it will stand strong in its housing.